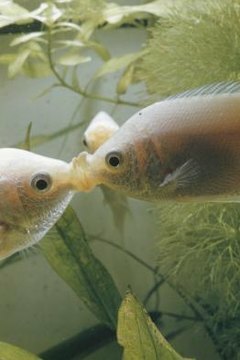 The kissing gourami or kissing fish (Helostoma temminkii) is best known for "kissing" each other in aquariums. However, this is not the kind of affectionate necking seen in humans. In this species, the kissing is a sign of aggression between males; they try to push each other around with their lips. In terms of water conditions, kissing gourami are not very picky. This leaves them open to sharing a tank with a wide variety of aquarium fish. Their ability to breathe air, coupled with their wide geographic range, makes them adaptable to a wide variety of aquarium conditions. They can thrive in water with a pH between 6.0 and 8.0. Additionally, they are not particular about water hardness. As tropical fish, they do need water with a temperature between 70 and 85 degrees Fahrenheit. These requirements overlap with those of many other tropical aquarium fish. Kissing gouramis may be sold as juveniles. However, they do grow up to a foot long. To avoid predation, avoid fish small enough to fit into the gourami's mouth. However, don't forget that kissing gouramis have relatively small mouths, so a number of small to medium catfish, cichlids and minnows can still share a tank with them without fear of predation. At the same time, sharing a tank with a larger fish can stress the smaller fish, so try to keep fish who are at least half the size of the gourami. Conversely, if your kissing gourami is still young, avoid keeping it with fish large enough to eat it. Kissing gouramis rate as semi-aggressive. They are not as brutal as some fish, but not exactly peaceful either. Most of the this species' aggression is directed at fish that look similar to it, particularly those with the same shape. For this reason, other gouramis should probably not share a tank with this species. With that in mind, kissing gouramis can live in a larger community-style aquarium. It can be tricky to keep more than one kissing gourami in a tank. But in the right conditions and a large tank, they can be kept in a group. This works best in a very large tank with a group raised together from a young age. A male-female pair is the most stable arrangement, but this still requires a sizable tank. If you are keeping a group, try a tank of at least 120 gallons. Aggression is most likely when two fully-grown fish get introduced to each other.